I am trying to sound upbeat about the whole thing, but in all honesty, I am frustrated and a little scared. Why are we so small? How could I have gained enough weight and at her last ultrasound she had enough space and was weighing what she should weigh (give or take) and I am still little? What the heck? And why are there no signs of her coming? I am scared. I just want her to be here now. I just want to know that everything is good and ok. Heartbeat was good and strong and all of those things today, but still, I am getting scared and nervous about all of it. I am to the point where I get a text from someone wanting to know how things are, and I am just annoyed by it. I text my Mom to tell her that and she told me that she understood completely. She said she was always super annoyed by everyone asking her questions. And at that time, there was not cell phones, there was not social media or text messages, so she could not be as easily asked as I can be. I am exhausted of lots of questions. I don't know what to say... nothing is happening, and when it does, you will hear from me. I hope that happens soon though. I am allowing myself a little treat today (something I have been working hard to cut out) and I was extra treaty with it today. Not JUST diet coke. 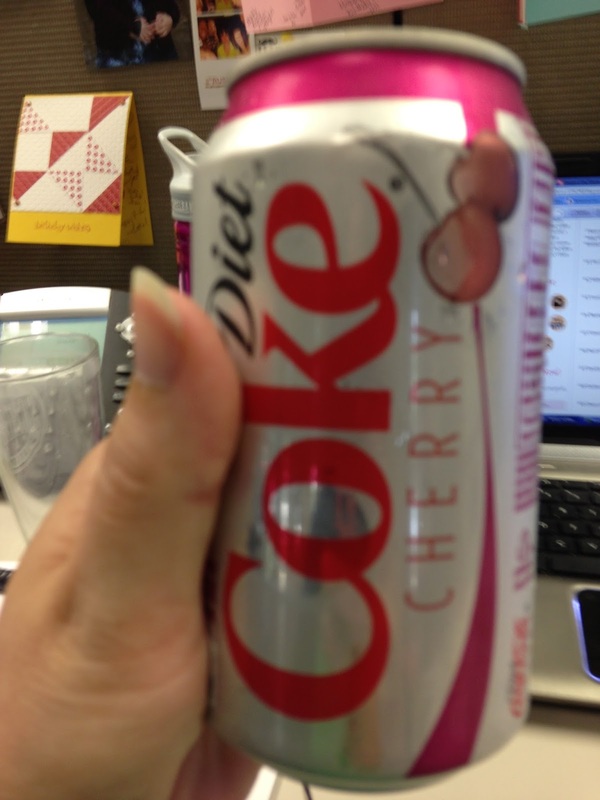 Diet CHERRY coke. Delicious little treat today. We used to have diet cherry zero coke, but now that they bought the diet instead of the zero, its much much more delicious. They are working on my "Mommy Room" here at work. I guess it has always been a governmental requirement, but we have not had an official place. There has been a room where it could be done, but now we have the real thing. 2 nice armchairs, a fridge (for storage), a lamp so we don't need to turn on overhead lights, etc. I feel lucky that I am the person who actually gets to benefit from this. I am disappointed that she isn't here yet, and yes, I am scared about it. But... I guess life will go on.